For millions of years, our planet earth has stood still against the human race’s countless endeavors for destruction. Nevertheless, it has become apparent in recent years that earth’s defenses may be failing, and that through the uncontrollable use of fossil fuels, global warming strikes as earth’s faint cry for help. With humans being reluctant to listen, we are already witnessing the consequences. However, the answer to earth’s problems lies in plain sight to those who are wise enough to look. The scientists of East Anglia University and Ocean University China investigated marine microorganisms, a mysterious yet fascinating field that was often neglected in the past, their findings could be a promising step in controlling global warming. A marine alphaproteobacterium, namely Labrenzia aggregata is a breakthrough discovery in the role of bacteria in the sulfur cycle and climate control. It was previously thought that only eukaryotes contributed to the cycle, but Labrenzia aggregata was found to convert dimethyl sulfoniopropionate (DMSP) into dimethyl sulfide (DMS) through the methionine transamination pathway. 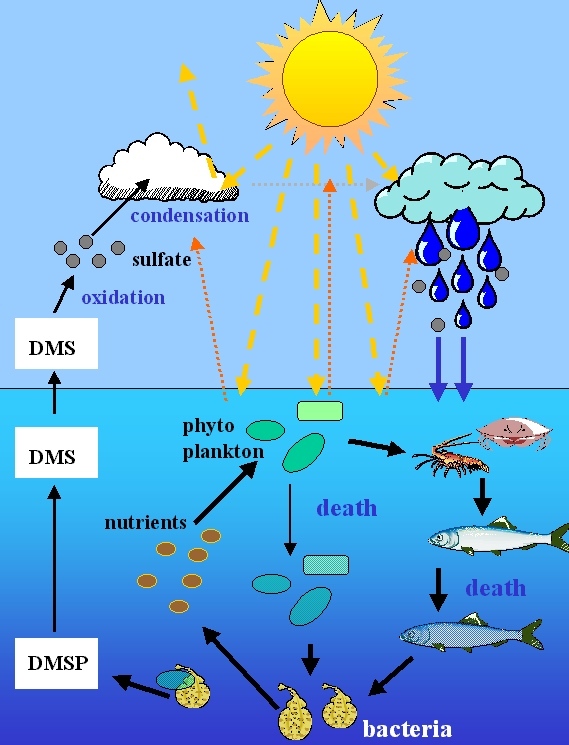 DMSP is a nutrient for marine microorganisms and a precursor for DMS. DMS plays a major role in climate control, it is oxidized in the atmosphere into sulfate aerosols which form cloud condensing nuclei that absorb UV radiation lowering atmospheric temperatures and counteracting the greenhouse effect, in addition, these clouds transfer sulfur from ocean to land contributing to the sulfur cycle. Labrenzia aggregata is the first discovered heterotrophic bacterium that is able to produce DMSP through de novo production of methionine through its acquisition of the dsyB gene, which encodes a methyltransferase enzyme. This provides further evidence that DMSP production is not restricted to phototrophs on the surface of the ocean, but extends through its entire depth. Finally, the discovery that a single gene transfer between different strains allowed DMSP production is remarkable. Will this transfer enable us to recruit other heterotrophs in combating global warming? Could Alphaproteobacteria be our salvation or is it only a few Labrenzia strains? The possibilities are endless and the prospects are exciting! The world is eager to see what the ocean has yet to offer. Comments Off on Could an alphaproteobacterium be a silent global warming slayer?